So there's me, cycling towards the City's Technical & Environmental Administration for a meeting at the Bicycle Office when I spot something strange outside their offices. I realised from a distance that it was a kind of wind turbine. For some reason, some people have issues with the sound that large wind turbines produce. Curiously, they don't seem to mind the sound car traffic generates. But when cars started appearing on the roads of the world, there were many complaints about the noise. I don't have this issue with wind turbines, personally, but as I cycled closer I was listening to hear when I'd be able to hear some sort of whine or swoosh sound. Amazingly, this wind spire, as it's called, was completely silent, even when standing underneath it. It was also a bit of a headturner as I was photographing it. People on both sides of the street stared at it and passersby read the sign. Four students rode past, girls, and one of them announced to her friends "Have you seen they have a new windmill?" They all looked up and one remarked, "cool!". 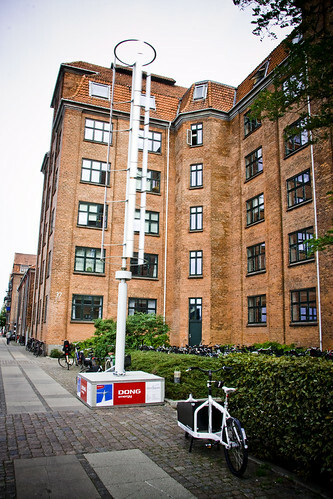 It is rather cool that the City of Copenhagen has taken the initiative to show some alternatives. Walking the walk AND talking the talk. The sign informs that it is a Wind Spire from an American company called Mariah Power and that it generates 2,000 kw a year. It's 9.1 metres tall, 1.2 metres in diameter, weighs 283 kg and is made of 80% recycled material. Perhaps this is the catalyst. Will we see these in every backyard? If you google "average household kw year" you get a variety of answers. Anybody out there have some reliable numbers? Whatever the case, if I could cut my electricity bills with a silent spire like this, I'd do it.